Life is a jungle out there, and eventually you will be faced with some form of car paint scratch. But not all car paint chips and scratches are created equal. And unfortunately much of the labels that have been attached to many subjects of car care and detailing are less than clear or specific. I know, I know...you don't want to learn something new, you simply want a magic wand you can wave over your car and have all those annoying little car paint chips and scratches disappear! 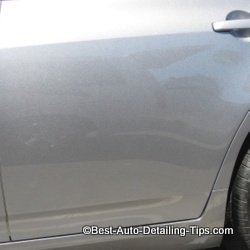 Yes in the land of fairy tales and unicorns none of us would have to endure the insults of car paint scratches and chips; but until then, follow along as I define the many types of paint scratches and chips and what you can do about them. As noted above, many labels and terms are floated around incorrectly and add additional confusion to any given subject; scratches in your cars paint is simply one of them. So for the sake of clarity, let's examine many of the types of car paint scratches you will encounter and some possible solutions to them. A pattern of scratches on your entire car. Transfer (paint or material from another object is transferred to your car and lies on-top of your paint and/or scratches. This would be the white material you are looking at. Some of you will think it is where the original paint has been scrapped completely off, when in fact it is house paint from a garage door frame that has transferred onto the bumper during the "mishap". Chipped and missing paint where the metal body panel has been crinkled. Directly where the plastic bumper and metal body panel meet. A series of individual scratches that lay beneath the transfer. Removal of heavy paint transfer. Polishing scratches to remove what was possible. 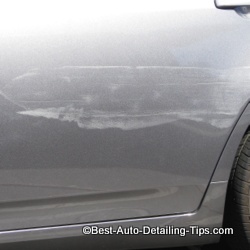 Using touch-up paint to "mask" areas of true paint damage. Obviously the Mustang "fix" from above is not brought to perfection, but when you take into consideration the cost of traditional body shop repairs, this is an acceptable fix that required virtually no down time, and 1/10th of what a body shop would have charged to make it "perfect"... which is almost a misnomer, as I like to tell people, "Once a car has seen the body shop, it never is really the same again." Various levels (or depths) of scratches. Removal of small paint transfer. Below is this kit from Turtle Wax (Yeah, who would have guessed) that I think is the best winning combination for any do-it-yourselfer or even a professional that doesn't have all the normal sanding discs and buffers that other professionals already have. Blends a basic, DIY car paint scratch repair kit with professional level "tools" that other basic kits do not include. Comes with 4 levels of sanding discs to perform what is called wet sanding. Comes with rubbing compound to remove sanding marks after you have sanded areas of damage. Comes with clear coat pen to fill in deeper scratches that cannot be sanded away, but have not gone all the way through to bare metal. Ideal as no power tools are required for truly professional results. Ideal solution to prevent bird-drop blobs when applying traditional car touch-up paint. To be used with your supplied touch-up paint; either from the dealership or a generic touch-up applicator. Outperforms the applicators of traditional touch-up paint. 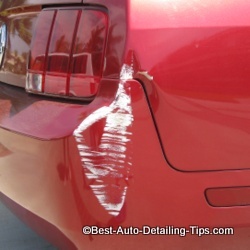 Another car paint scratch removal kit. Not a paint touch-up kit. Long time trusted name in professional products. For use with your regular drill motor. Use to polish away or diminish light scratches. 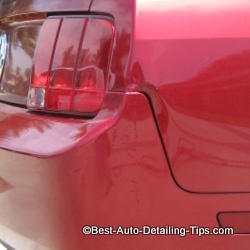 Use anywhere you find miscellaneous scuffs and marks; around door handles, trunk handle, etc. to remove dirt, scuffs, light abrasions, and light scratches. Use detailing clay to remove air-borne contaminants that have bonded to the surface of your cars paint. Polish your car paint with a user-friendly car polisher with my Car Polishing for Beginners. Use a quality car wax to enhance and protect your cars finish.